There are some experiences that you know from the beginning will stick with you for a lifetime, and that thought creates equal parts pressure and excitement. The Mark Twain 100 was just such an experience, and I couldn’t have been happier with how the trip turned out. The lead-up to the weekend seemed like an eternity. I’ve been preparing for this race all summer, targeting it, and planning all of my training around this weekend. Some folks say it’s never good to put all your eggs in one basket, but this was my “A” race. No matter what happened, my hard work this year was leading up to that starting line. This race was a series of “firsts” for me. I spent the previous two weeks working out the logistics for the trip, which was far more time than I ever remember spending on that side of race preparation. The beautiful epicurean and I would be camping near the starting line (you can’t argue with free camping! ), so not only was I thinking about packing for the race itself, but also our camping needs. We also decided to bring Looper along for some outdoor time, which added another level of preparation. On top of that, I was going to have pacers, in the form of 4 amazing friends, for the first time in a race. I figured I should probably decide how to work with them as well. Even though this was my second time tackling the 100 mile distance, my previous adventure in Arizona was quite different. 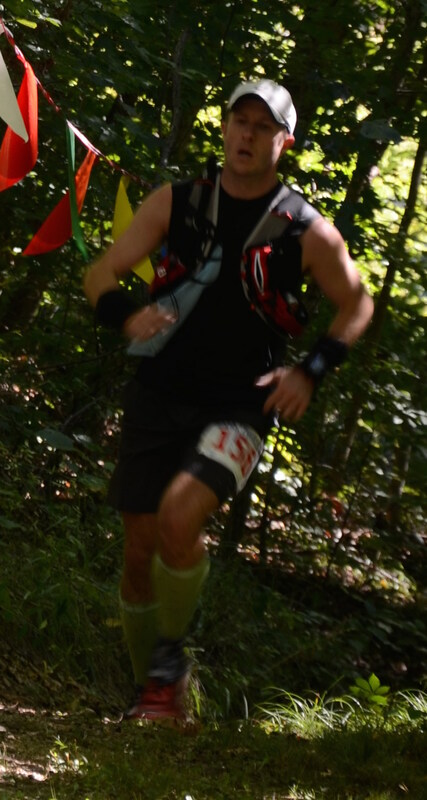 This would be my first true 100 mile trail race. Needless to say, I had a lot on my mind leading up to our departure. We got everything loaded into the car (it just barely fit), and headed south for Berryman, MO around 8:00AM on Friday. The all-knowing Google told us it would be about a 7 hour drive, which didn’t seem that daunting, although I wasn’t crazy about spending that long cramped up in a car before running the next day. The drive ended up taking closer to 9 hours, and we arrived at the campground with rain falling on our heads. This was not a good sign! We set up camp in the rain, and then hopped back in the car to head to packet pick-up. Check-in was incredibly smooth, I collected my materials, along with a really nice hooded sweatshirt, and we stuck around for the pasta dinner. There was a brief race meeting at 7:00PM, and then a raffle for some great Salomon (one of the sponsors) swag. I ended up winning a pair of Salomon gaiters, which was a nice perk. By the time we got back to the campsite, it was dark and still drizzling. Crawling into the tent in the dark, with temps in the 40s and rain, didn’t exactly make for the comfortable evening I was hoping for but we made it work. Our 4 intrepid friends were still on the road, and would end up rolling into camp around midnight, by which time the epicurean and I were long asleep, albeit restlessly. I woke up around 4:30AM to give myself time to eat a light breakfast (Cliff bar, banana, water) and get dressed. There was quite a chill in the air, but I knew I’d warm up pretty quickly once I started running. The darkness was still consuming the everything around us for the beginning of this 25-mile loop through the Mark Twain National Forrest, so I mounted a headlamp, slipped on arm warmers and a long-sleeve shirt, and waited for the 6AM start. This was a small race, with perhaps 60 people starting the 100-miler (4 loops), and another 100 beginning the 50-miler (2 loops). I anxiously awaited the start, sure that I forgot something, and then the clock ticked down to zero, and we were off. 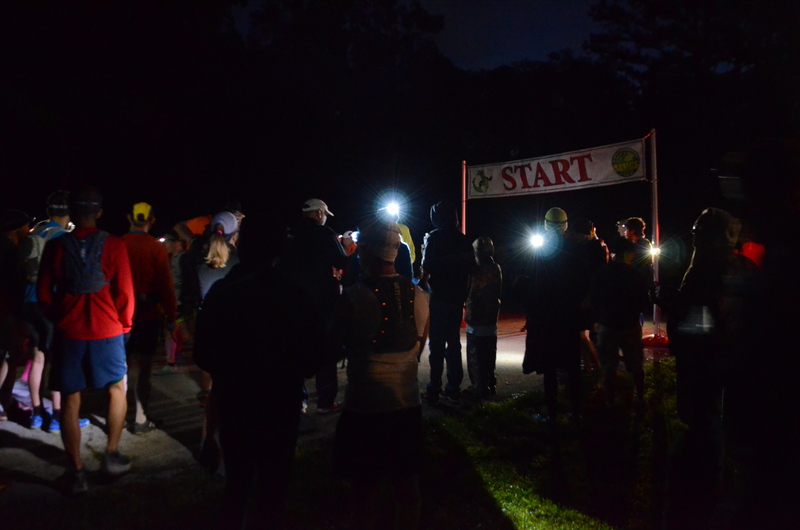 The course itself is a counter-clockwise loop and is 99% single track, so I fell in line with some other runners near the middle of the pack, and we made our way in the dark. Everyone was in really good spirits, and I was content to push forward and listen to the conversations around me. Many of the runners appeared to be from the St. Louis area (the race is put on by a St. Louis running group, the Slugs), and folks were talking about previous experiences on this particular trail. I knew going into the race that the course was single track, but it became clear pretty early that I had under-estimated the technical nature of the trail. It was certainly not as rocky as Flatrock, but I was not going to escape the constant bombardment of rocks and tree roots, combined with endless rolling hills and switchbacks. There was only one larger than average climb early in the race, but the route still managed 2,500 feet of elevation gain per loop. In some ways, the first loop went by in a bit of a blur. We spent the first hour in the dark, so all of my concentration was focused on keeping my footing. We made it to the first aid station, around mile 5, as the sun was coming up, and I was able to briefly stop and take in my surroundings. It felt good to take the headlamp off, and my core had warmed up nicely, although my hands were still a bit cold. 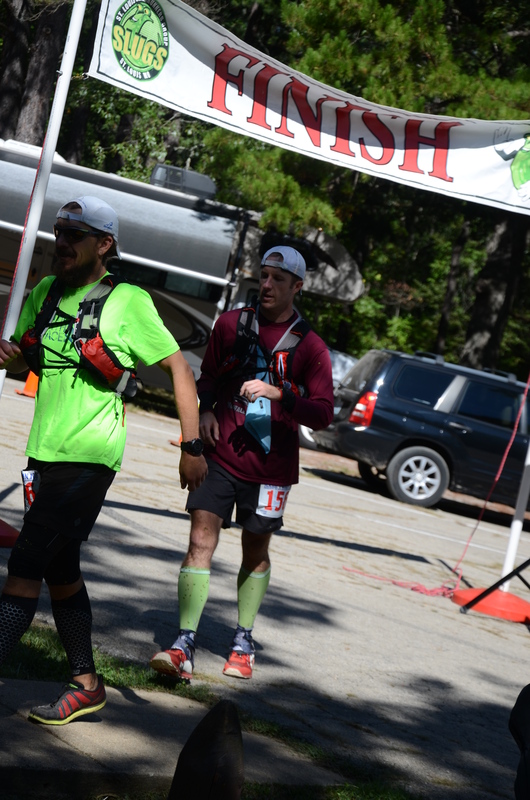 Aid stations are perfect for breaking up large groups a bit too, and I found myself with a bit more elbow room for the next segment, which was nice. I was feeling really good, easily running the downhills and flats, and tackling the hills with plenty of energy. I told myself I was not going to go out too fast, as I am oft prone to do, and at the time, I thought I was doing a really good job of holding back and remembering I needed to do this 4 times. The first 9 miles were definitely a technical challenge, and it became clear by the end of the loop that these miles were the most difficult on the course. Just before the aid station, there was a 3/10 mile section of asphalt which felt incredibly strange on my feet after they had taken a rocky beating for so long. This strange sensation only became more pronounced as the race went on. Luckily, the epicurean and the rest of my crew were waiting for me at the mile 9 aid station (Huck’s Watering Hole). It was great to see them, and they gave me the once over to see if I needed anything, and I headed back out to tackle the remaining 16 miles. This was the only crew access point, other than the start/finish area (Jackson’s Island), so I knew I was on my own for a few hours. There was one stream crossing on the route, and I came up on it almost immediately after leaving Huck’s Watering Hole. Luckily, the water levels were pretty low, so I was able to mostly step across on rocks although I still got a bit wet. My Altra Lone Peak 1.5s drained and dried pretty quickly, however, and I knew I had made the right choice with these more protective shoes. It was clear early on that my Dirty Girl gaiters were a good choice as well! I made my way to the Tom’s Canteen aid station at mile 15, still feeling good, and restocked on water. 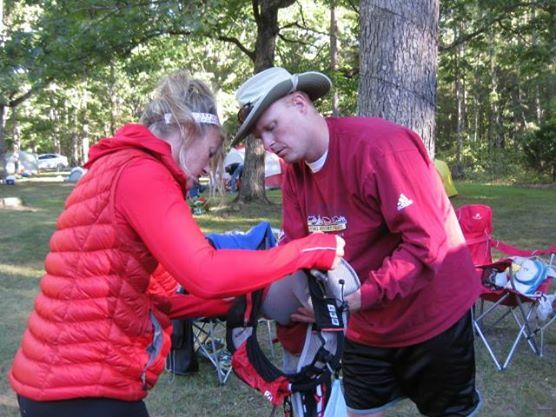 Each and every one of the aid stations was incredibly well stocked, and the volunteers were amazing! As soon as I arrived, they were asking what I needed, filling my soft flasks, and offering me a wide array of sweet and salty foods to keep my energy up. The last 10 miles, with another aid station in between, went really well. The trail in this section was quite runnable, and I was able to make good time on flatter and more open terrain, although the switchbacks continued. In all, the final 16 miles of the loop was somewhat easier to tackle, and much more open than the first 9 miles. Soon, of course, it would all blend together pretty thoroughly. I emerged from the forest and ran comfortably into Jackson’s Island, and everyone was waiting for me. I had covered the 25 miles in about 5 hours, and my legs were feeling really good. I shed my long sleeve shirt and arm warmers, and my amazing crew restocked me with Tailwind, Honey stinger chews, and bodyglide. The sun was out, the air was warming, and it was an absolutely perfect day to be out on the trails. I couldn’t have asked for a better day as I waved goodbye to everyone and headed back out for loop 2. Loop 2: Miles 26-50- Oh right, I have to keep running! My momentum continued to carry me into the next loop, and my legs were holding up nicely. I began to feel some fatigue as the miles ticked away, but that was to be expected regardless. I knew that the 5 hour mark was not sustainable for 25 miles, so I began making a more intentional effort to slow down even further. This became easier as I had more of the trail to myself, although I was still happily crossing paths with plenty of other folks. Slowing down meant I needed to be even more careful of my footing, as I wasn’t going at a normal pace. I managed to kick a few rocks and tree roots, but nothing too substantial. However, I was happy for the more structured Lone Peaks to protect my feet a bit. 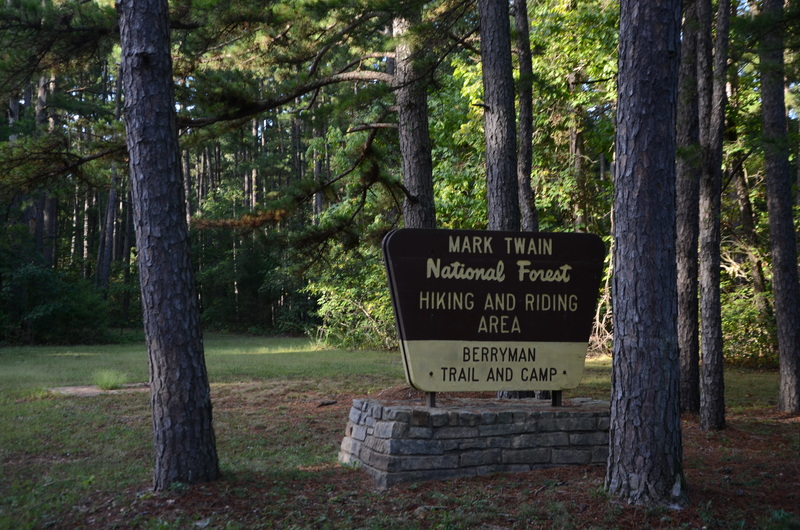 I knew the rocks and roots would be having plenty of other conversations with my toes as the day wore on, and although I’d never lost a toe on a run, I figured I stood the strongest chance yet in the Mark Twain National Forrest. I rolled into Huck’s Watering Hole still feeling good and excited about passing the 50K mark. The trails were certainly beginning to make their mark on my feet but my legs were feeling good. Everyone was waiting for me, and filled up my bottles and nutrition. At this point, they had everything down to a science and it was fun to watch! They knew exactly what they were doing and all the right questions to ask. I drank some ginger ale and ate some pretzels and M & Ms, and was back out on the course in about 5 minutes. I hopped from rock to rock over the stream again, although I did manage to submerge one foot in the water before making it to the other side. The following 16 miles were all about patience, attention, and consistency. I had a much firmer grasp on the trail itself, and was comfortable being out there. However, I did manage to catch my right foot on a rock and in falling forward and catching myself, hyperextended my right hamstring. This definitely caused some pain and would end up giving me problems the rest of the race. I pushed through it though, and it didn’t slow me down all that much. I made my way back and forth on the constant switchbacks yet again, and by this time, they seemed to all bur together in the woods. I found myself thinking I knew where I was on many occasions, only to realize I was wrong. 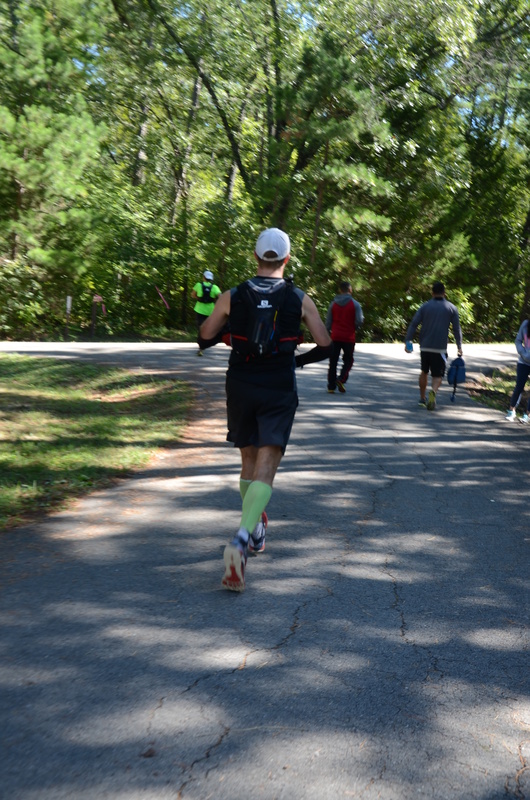 In the last few miles, I fell in step with another guy running the 100-miler and we had some nice conversations, which helped the time roll by that much quicker. He had gone out faster than he had wanted as well, so we were both in the same boat and focusing on slowing things down a bit. The added walking breaks felt good on my legs, and I was happy for the company.